Last summer at this point, we were at least cautiously optimistic, with the club having invested approximately €90m during the transfer window. We also had a coach who had a good track record and was very passionate and outspoken (translation: easy to believe in.) So although we were still missing some pieces and still clinging to some dead weight, many fans really believed we could get back into Europe last season. But this year… it’s all so strange. When the preliminary agreement to sell the club was signed, some people acted like we won the lottery. But it’s really more like when your dad takes a new job at a new company and there is the opportunity in the future for more pay, but you need new shoes now. With the sale delayed for so long, we are limping into this season with a very minimal mercato and a coach who doesn’t have as much success under his belt. Plus, those friendlies… some of the scorelines ended okay, but if you watched the games, it was more than enough to give you preseason anxiety. First, we went to France and beat Bordeaux – the 14th place Ligue 1 team last year. The score was 2-1, but on the pitch it was harder to tell which team placed 14th and which team placed 7th in their respective leagues. Our midfield was below mediocre, our defensive lapses were atrocious, and we were dominated in possession. Also, there is still such a vast difference between our starting eleven and our bench, it’s incredible. Suso scored a brace in the first half, which was great. But fans knew what he was capable of well before his loan to Genoa. Next up was the tour of America, or the ICC Tournament. The first stop was in Chicago, where we met our old friend Carletto and his Bayern Munich team. It wasn’t pretty, but we managed to hang with them through regulation time, scoring three goals each. Milan’s first was from Niang, then Bertolacci, then Kucka. Vergara gave up a late penalty that allowed Bayern back in the game, he hasn’t had the best of summers. He’s just another example of how much weaker our bench players are than our starters. Our penalties were taken well, including Kuco’s amazing cucchiaio. But Donnarumma was the hero, saving Rafinha’s penalty. So Milan won 5-3 on penalties, but were definitely not the better team, with our midfield overrun, making big defensive errors, and maintaining only 38% possession, despite Montella’s desired possession-based system. If first never follows, be afraid. Be very afraid. After our amazing win, we faced Liverpool in Santa Clara, California. We lost 2-0, which was very fair, if not generous, given the way we played. 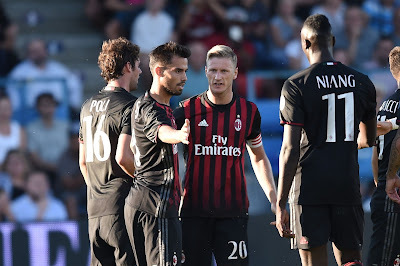 This may seem vaguely familiar, but Milan suffered in the midfield, had poor defensive errors, and only 40% possession against the team that finished eighth in the Premier League last year. Our play decidedly worsened as bench players were subbed on. I know it takes a while for a manager to leave his imprint, but it was becoming obvious that mentality, probably the most culpable for our poor play and errors, would not be changing anytime soon. So while the wounds were still fresh, the team flew to Minnesota to play the opening game at Vikings stadium. We faced an old enemy in Conte, now at the helm of Chelsea. But who am I kidding? Our biggest enemy is ourselves. Despite finally reaching 53% possession, we would lose this match 3-1, largely due to an impotent midfield and defensive errors. Despite Bonaventura’s beautiful free kick, we conceded three goals, like the penalty given up by Poli’s handball. But still, the same old Milan. Oh yeah, and how about that bench? Next up was the Trofeo TIM, where we faced La Liga’s 6th place team last year, Celta Vigo. The 45 minute match was incredibly frustrating, with Milan playing like Milan, and Celta Vigo unable to take advantage of that. We managed to win on penalties, though, largely due to Diego Lopez saving two penalties from the Spanish side. After that, we faced Serie A’s 6th place team last year, Sassuolo. If it’s possible, we played even worse, despite Niang scoring a penalty and then a nice tap in from a great Suso assist. But Sassuolo equalized, and then with the defensive error of the preseason, Vergara gifted them a third. So we lost 3-2 to Sassuolo, with a nightmare midfield and massive defensive errors. When our bench players were on, it was like watching a Lega Pro side. No, I think that may be insulting to the Lega Pro sides. Finally was yesterday’s friendly against Freiburg, the newly promoted Bundesliga side. We actually won 2-0, but it wasn’t easy, and it wasn’t even obvious. Were it not for Donnarumma, for example, the scoreline could have been very different. We were able to keep 54% possession, but both of Luiz Adriano’s goals were scored due to massive, Milan-like defensive errors by Freiburg. Without those errors, it’s difficult to see how we might have scored. Our midfield is still poor, we still make defensive errors, and even when we have possession, we don’t do much with it. And when our starters are injured or subbed, it's an absolute nightmare. It’s still just the same old Milan, just wearing new kits. Are you sensing a theme? Poor midfield, defensive errors, and poor possession or not taking advantage of possession? A bench that makes you break out in hives every time they are called upon? To say nothing of the non-statistical mentality issues we have. And that’s just how we play. We also have an injury list like a midseason playing in three competitions Allegri side. We are missing Romagnoli, Zapata, Mauri, Lapadula, Vangioni, Suso, and Niang. And the season hasn’t even kicked off. Niang and Suso were our two brightest spots amongst all of these friendlies, and we haven’t even seen Lapadula or Vangioni yet. So even without the uncertainties of the preliminary agreement to sell the club, and with no appreciable movement in the mercato particularly when compared to other Serie A teams, Milan fans have every right to be distressed. 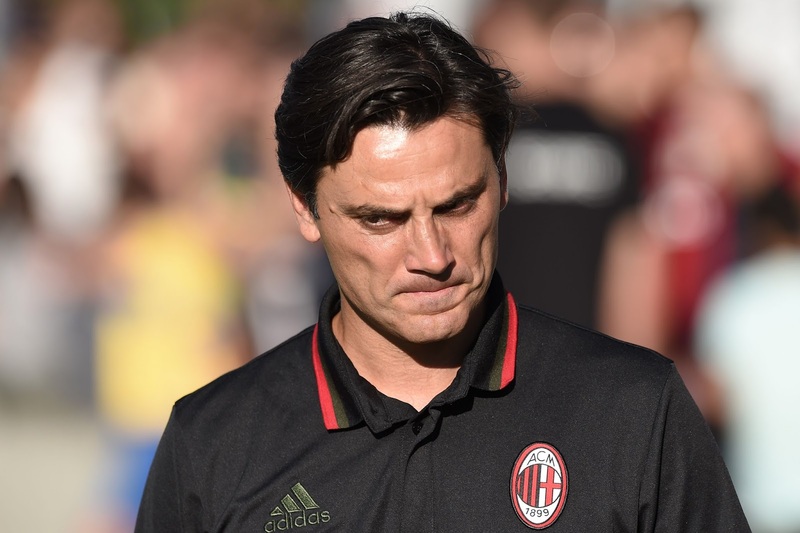 It may take a while for Montella to imprint his style of play on the team, but if he keeps benching Montolivo, he may not have much time. And the mentality is the larger issue. If he addresses it at all, will he be able to make a difference before he is given his marching orders? Meanwhile, on the pitch, we face Mihajlovic’ Torino on Sunday, and he will not be in any way forgiving, I’m sure. We have a tough set of fixtures to start, actually, and none of them will be forgiving, but rather they will all seek to take advantage of our well-known weaknesses. So is it any wonder, considering everything, that Milan fans are not excited for Serie A to kickoff? Most of our optimism and eager anticipation has been replaced by some serious preseason anxiety.